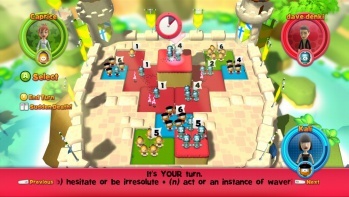 The territory-grabbing word game debuts on XBLA today after a long fight. They said it couldn't be done. No one in their right mind would actually shell out their hard-earned cash on a *gasp* word game. Ignoring the fact that Scrabble and Scrabbulous/Word with Friends and Bookworm actually sold quite well for their respective publishers, when Colin Anderson of the Dundee, Scotland based Denki "Digital Toy Foundry" pitched his idea for a Risk-type game using words as ammunition, the marketing and finance people all turned it down. Why? Because they are all dumb. "Almost without exception every acquisition team we showed it to thought it was a certifiable, bankable hit - just as we did," wrote Anderson in a blog post celebrating Quarrel's release on XBLA today. "The problems only started once they'd passed Quarrel up the decision tree to their finance and marketing teams - the bit more commonly known as 'The Industry'." Anderson said he heard the same complaints over and over again. "'This game is fundamentally broken - how can I possibly win with only 3 letters when my opponent has 8? '; 'We could never sell this because it's English language only'; 'It looks like a kids game, but it's way too hard for kids' and everywhere (trust me - everywhere) in between. We heard the same justifications for passing on it over and over again ad nauseam." The team at Denki would not be dissuaded, and they continued making the game that would eventually be Quarrel. An iPhone version came out last August, and was a modest hit garnering supporters among gaming journalists and fans alike. Anderson had his sights set on a bigger market for Quarrel. "We're all very proud of the Xbox version of Quarrel - the iPhone version is great too of course, but it was originally built with XBLA multiplayer in mind," Anderson wrote. "We believe that's where Quarrel moves from being a good game in to being a great game." So now that Quarrel is available for 400 MS points or $5, and it supports 4 player multiplayer, Anderson suggests snatching it up and giving some points to your friends so they can play too. "Why not gift some points to a few friends who are always kicking your arse at CoD and see how clever they are when it's about words rather than guns?" You know what? I may just do that. Hell, if I have the chance to prove the marketing and finance people of this screwed up industry wrong, I'm going to take it. Join me in buying Quarrel here.